[tweetmeme source=”atripathy” only_single=false]I have earlier written about that Insight at the point of decision making/action is critical. I came across a great example of it from the good folks at Sunlight Foundation, who are trying to bring transparency to political influence. 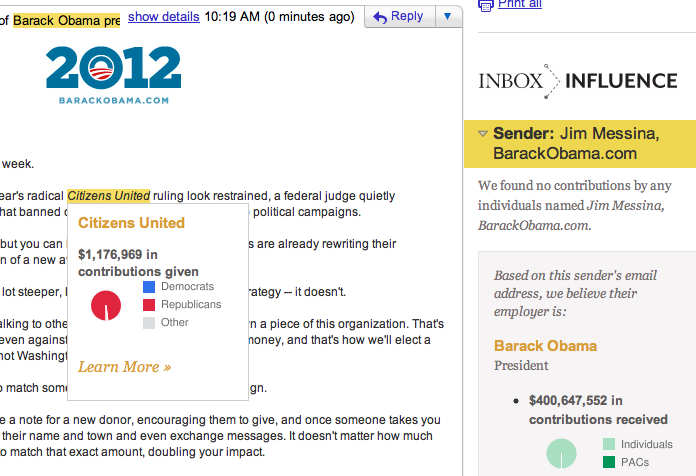 Inbox Influence is a browser extension that adds political influence data to your Gmail messages. With Inbox Influence installed, you’ll see information on the sender of each email, the company from which it’s sent, and any politician, company, union or political action committee mentioned in the body of the email. The information is added unobtrusively and nearly instantaneously, and includes campaign contributions, fundraisers and lobbying activity. You can use it to add context to news alerts, political mailers and corporate emails, or just to see who your friends donated to in the last election. By focusing on email they have provided a tool which provides insights where the action (solicitation, support, contribution commitment) is most likely to happen and makes it part of the normal workflow. I played around with the tool a bit and it was interesting to see the campaign contribution and lobbying activity of financial institutions, cable and cell phone companies from their statement notifications that they sent to my Gmail account. This blog entry explains the technical challenges that the developer had to overcome to build this nifty tool and description of the back-end databases it searches. The key take away is not to underestimate the effort it takes to overcome the last mile infrastructure issues as they are thinking about their BI architecture. It is normally the difference between a success and failure of the project from a business perspective. Very innovative embedding of the data! Thanks for sharing.